The scents of urine, hay, animal sweat, urine and feces filled our noses. Bray’s, squawks, quacks, baa’s and squeals filled our ears. Rough wood, the prickle of hay and the gravel-like feel of feed filled our hands. A parade of on-lookers filled our peripheral view. As a life-long suburbanista- girl scout camp and childhood visits to a friends farm house and petting zoos are about the sum total of my barn experience. Girl scout camp involved horses and screeching pre-pubescent girls …. (Not peaceful.) Visits our friends farm involved much chasing of chickens.. (rather fun if you ignore the smell.) squeeing over pigs and brushing of horses manes while trying not to get stomped under hoof. Fun, but again: not peaceful. Barns do not produce peace. They produce poo. And noise. And chaos. And stink…with maybe quiet moments of peace…as a lamb lies nestled with it’s mother or piggies lie in a sleeping mass of pink. And yet- over 2,000 years ago- a barn did just that. It produced peace. There was braying and neighing and stink and wallow. There was squalor and chaos and a parade of on-lookers. But, wrapped in swaddling clothes-amidst the chaos- was born peace. A miracle on so many levels. This year, I feel like my life is a barn. It’s drafty, it’s overwhelming, it’s noisy and to be honest? With the continued battle with my husband’s cancer along with the stress of life and family….. it’s been stinking. It’s been painful. Pain is not peaceful. There have been moments of peace.. (mostly on beaches:P) But it hasn’t been peace-Full. I miss peace. This morning.. I again read the story of that barn. I read of how peace was born into the world.. in the middle of chaos. In the middle of a tyrant’s slaughter of innocence….and I remembered peace. The peace found in love, acceptance and forgiveness. The same peace that was born in that barn so long ago. Instead of peace wrapped in swaddling clothes- it was wrapped in her heart…tied with a ribbon of grace and laid in the barn of her life. And today, in the middle of this barn, I again found that peace. In the fact that the chaos of my worries can bring peace. Peace that I don’t have to be enough. In the fact that I don’t have to have all the answers. In the fact that God is more than able to get us through whatever comes our way. (And whether we like it or not.) In the fact that I’m not alone. Peace born in chaos. The dichotomy of Christmas. The mystery. The miracle. The beauty. My life feels like chaos…. 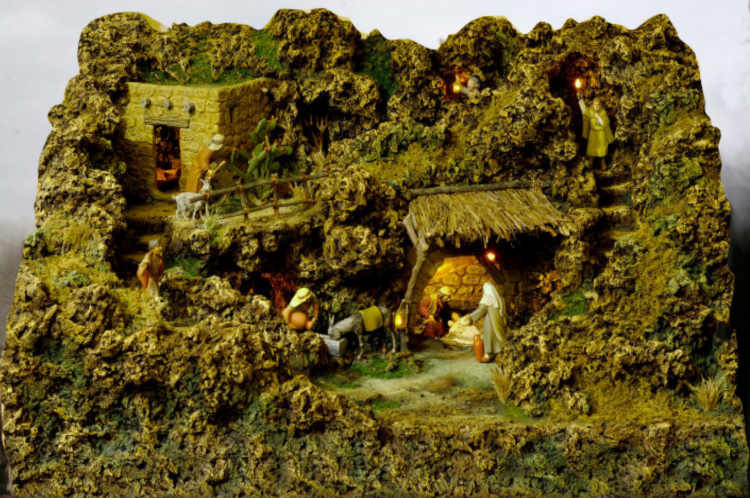 But–I’m asking God to sustain that manger miracle of peace in my heart….and I’m praying he does the same for you. Maybe chaos doesn’t mean God isn’t involved.. it means he’s again- about to birth peace…. Repost from last year…..but still fitting… some struggles improve..(A year after my hubby’s diagnosis we are in an upswing… last PSA was undetectable. We now test eery 3 months….for now- cancer takes a back burner. but then…. new struggles develop. And we get through them. together. I pray. a lot. (Let’s face it… not much else I can do at the moment.) I ask for wisdom., I ask for forgiveness, I plead for healing, for myself, for my husband. I pray that God will make up through love the things I can’t do with and for my kids right now. I pray for others. I pray for the impoverished, the entrapped, the persecuted, the addicted, the hurting. Like I said: I pray. The truth is….lately- I’ve felt like God isn’t answering. (Or, rather, I’m not liking the answers.) I pray for wisdom, and discover more questions. I pray for forgiveness and discover more sin. I plead for healing and find more pain, more disease. More tests to be run, more waiting to be waited. We currently face: Cancer, chronic illness and pain. I’m in the middle of a difficult surgical recovery. There has been loss. I have questions without clear answers but with potential eternal consequences. I recently told a friend ” I feel like every time I come up for air another wave crashes on my head. ” (Heart?) I feel: Frustrated. Overwhelmed. I’m afraid that the reason God hasn’t answered me (The way I want him to) is because of my lack of faith…. Maybe, it’s my own fault. As I read “The Mercy Prayer” what resonated most wasn’t the words….it was their truth. Truth that changed my perspective. God hasn’t been ignoring or denying my requests. He’s been answering them with mercy. Mercy to bear pain. Mercy to stand up under temptation. Mercy in kindness. Mercy in meals made with love to sustain us through recoveries. Mercy in provision. Mercy in lack. Mercy to find joy in the tragedy and pain that threatens to engulf. Mercy to sit with unanswered questions. (And not lose my mind. (Mostly.) Mercy in nested reminders of His love….from friends, and in places where I’ve least expected to find them. Reading these words, my hope is renewed. I’m not a heretic. I’m not (that) crazy. My focus is changed. I will endeavor to quit telling God what he should do….and ask him to do what he always does. Lord, have mercy. The heart of the matter.. is always: My need for Mercy. Of all kinds. “His grace (truly) is sufficient” and it begins with mercy. Read this book. Let it speak to your heart. Let our hearts beat to the rhythm of the mercy prayer…..I have a feeling that if we do….. they will be beating in time with the very heart of God. What a different world that would be. Again: Lord, have mercy, Even here. 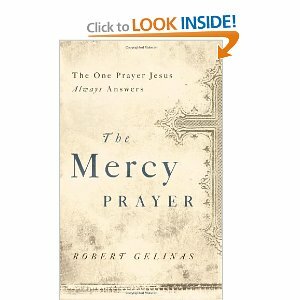 “The Mercy Prayer” Available on Amazon- or at your local bookstore. This Book? NOT THAT. No worries. No formula… just an affirmation of our greatest need-for grace through mercy- always being met. By a God who delights to show mercy and grant grace. I picked yet another finger-printed and milk filmed glass from the dishwater. For a split second, I considered ACCIDENTLY dropping it so I wouldn’t have to wash it. I’m THAT sick of doing dishes. Unfortunately, I argued with my logic. (Shut up, I’m not crazy, I do that, don’t YOU?) “But it’s BORING and a WASTE of my TIME!” I countered. “Make it a spiritual practice… an act of service and love for your family…” I tried hard, to convince myself. By the time the argument was over, the sink was cleaned and dishes were washed. The only thing left was the battle in my heart. I couldn’t let it go. I knew that before I could reach the light switch.. some member of this family of five would have dirtied another dish, kick starting the battle all over again. I grabbed paperplates and plastic cups and put them on the counter. Clearly I needed a dishwashing break before I totally lost my mind. (Sanity being saved, trumps going green.) I went to that perfect corner on the couch. The one that’s so old it’s dented in the shape of my backside. I picked up my knitting. I knit. I kept knitting. One stitch after another. Then it hit me… honestly? Part of what I like about knitting is the quiet repetitive-ness of it. The chance to think.. the opportunity to be (almost) still. The creative process of producing something useful. I also love spinning for the same reasons…. But DISHWASHING? I HATE IT for THE SAME REASONS. It didn’t make sense. I knit faster… hoping some mysterious answer to this problem would be found in the completed project…then it hit me. Whats’ the difference? I don’t HAVE to knit. I have a choice. I also don’t HAVE to spin. I don’t HAVE to sit on the beach and listen to the music of the waves that are just as repetitive and meditative…I don’t HAVE to rock a baby or flip through a magazine savoring pictures without ingesting words…but I do. Because, I want to. Maybe that’s the ony difference between meditative activities and annoying ones.. maybe it’s all about the HAVE TO factor. I thought about it some more… by that time I had another sink of dishes to do. I stood in the kitchen. The battle started up again. I stepped back. I suddenly realized: I didn’t HAVE to do them. I had options. Hide them in the oven until the dishwasher repair guy finally shows up. I could enjoy the quiet meditative redemptive quality of washing them. I turned on the tap. I smiled at the beautiful, curved brushed nickel faucet my husband installed for me. I watched the water flow. I watched tiny bubbles form like sea foam. I almost giggled when miniature bubbles floated into the air from the soap bottle when I plopped it back on the counter. I prayed for friends as I cleaned the milk filmed glasses. 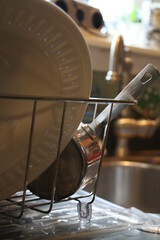 I listened to hope grow in my heart as I washed plates. I thanked God for food as I washed it from the silverware. Before I knew it.. I was out of dishes. I asked if anyone had any more…they didn’t. I was done. Yeah.. the HAVE to Factor was the difference.. so was recognizing that I have a choice. So whether you eat or drink or whatever you do, do it all for the glory of God. Do not cause anyone to stumble, whether Jews, Greeks or the church of God— even as I try to please everybody in every way. For I am not seeking my own good but the good of many, so that they may be saved.